Robert Simpson – co-inventor of the Saffir-Simpson Hurricane Potential Damage Scale – developed a lifelong interest in hurricanes after a strong one struck his home town in Texas when he was six years old. Fifty years later, after a personal tour of the wreckage left behind in Mississippi and Louisiana by Hurricane Camille, Simpson got together with civil engineer Herbert Saffir to develop a classification system that would tell emergency managers the general level of damage to expect from an approaching hurricane. Today, at age 101, although retired, he is still contributing to the field. Bob Simpson was born and raised in Corpus Christi, Texas. When he was six, a powerful hurricane blew in, on September 14, 1919, killing hundreds of people, including one of his family members. As the Simpson family sat down to their Sunday dinner around noon, the sea surged into the low section of town and cut off the road…The Simpsons watched in horror through their dining room window as a large house from across the street floated past, barely missed them, and crashed into the home next door, destroying both structures. Clyde Simpson scooped up young Robert as his brother-in-law steered Grandma Simpson’s wheelchair into the flooded backyard. Robert’s mother dumped the chicken and donuts from the dinner table into a paper bag and held it over her head as she waded into the rising water. The sight that was indelibly etched in young Robert Simpson’s memory was that of his tired mother struggling to keep that bag of food above the waves, her arms growing ever weaker, until finally the bag met the water and the food floated away…The Simpson family, its home situated close to high ground, survived. They returned after the storm to find their house filled with mud and debris, its walls smeared with tar and oil from the city’s ruptured petroleum tanks. 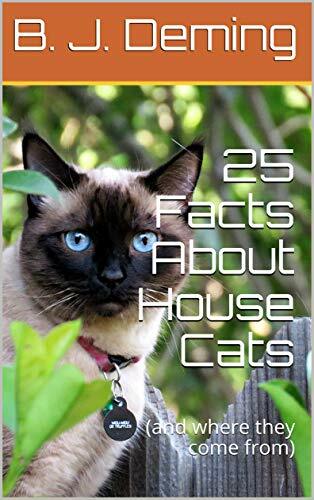 Young Robert saw death all around – dead dogs, cats, birds, and rats and the remains of one neighbor who hadn’t made it out in time. Such an experience would make most of us consider moving far inland. It inspired Robert Simpson to become a meteorologist and specialize in tropical cyclones. Simpson went to the University of Chicago and then joined the US Weather Bureau in 1940 and began to study hurricanes, doing graduate work in Chicago in 1943 and 1944. Simpson saw tropical cyclones as predictable phenomena, but obviously much more information about their internal structure and processes was needed before accurate predictions could be made. In 1945, while helping set up the Army Air Force weather school in Panama, he took his first plane ride into a hurricane. During the 1950s, while working for the Weather Bureau in Florida and Hawaii, Robert Simpson also did research on hurricanes and typhoons (these are the same storms – tropical cyclones – but have different names in the Atlantic basin and parts of the Pacific. 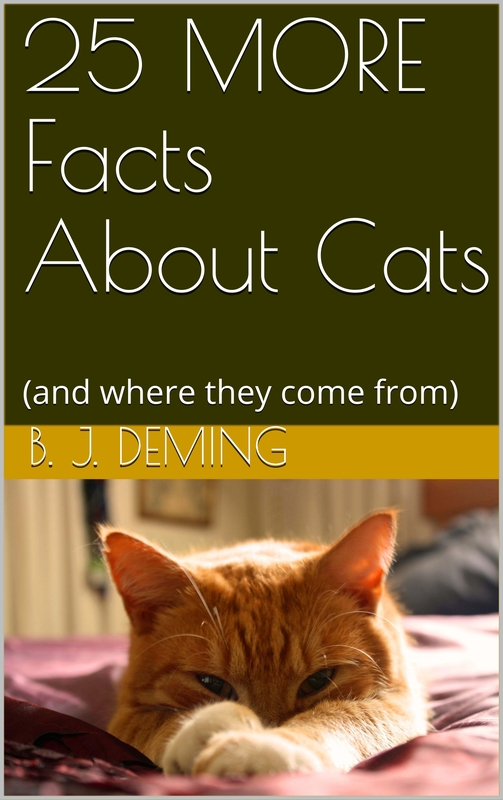 These studies of his were purely informal. Although Simpson wrote three different proposals for hurricane research, he didn’t have much political clout: Congress deleted each one before passing the Weather Bureau annual budget. Murrow’s description of Edna’s eyewall – “What a beautiful sight. We’re in an ampitheater surrounded by clouds. [The ocean] looks like a lovely alpine lake surrounded by snow” – also fits this 2005 image from a Hurricane Hunter flight into Hurricane Katrina. Murrow’s dramatic report stirred up public interest in tropical weather. Elena intensified and later rampaged through parts of New England, making it a political and social issue as well. A Rhode Island senator complained that the Weather Bureau didn’t have a hurricane research program. The bureau chief told him about Simpson’s proposals. Simpson met with and impressed the senator, who then drummed up support on Capitol Hill. In 1955 Congress created the National Hurricane Research Project, with Robert Simpson as its director. For four years, Simpson managed the NHRP. When its longevity was assured in 1959, he went back to the University of Chicago to finish his doctorate. With a PhD in meteorology, he returned to Washington as the Weather Bureau’s Deputy Director of Research (Severe Storms). He helped found the predecessor of today’s National Severe Storms Laboratory and also did research on seeding hurricanes. In 1968, Simpson became NHC director. The following year, he would face what he later called “the most critical and hair-raising experience” of his six-year career in that position. Camille became a named storm on August 14, 1969, when it was about 480 miles south of Miami. It was small but reached hurricane intensity the next day when it was south of the western edge of Cuba. It weakened somewhat during its passage over Cuba on the 15th, when 92-mph winds were recorded and 10 inches of rain fell, but started strengthening again when it reached the Gulf of Mexico. At 8 a.m. Central on Saturday, August 16th, Simpson issued a hurricane watch for the Gulf Coast between Biloxi, Mississippi, and St. Marks, Florida, and told reporters that it would be 36-48 hours before it could be determined if Camille would be a major threat to Florida. No reconnaissance aircraft were available. 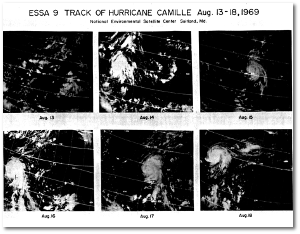 Satellite photos were available – indeed, Camille was the first hurricane to be photographed over its entire life cycle – but resolution was poor and the images didn’t penetrate below the cloud tops. The people in Washington who were analyzing the satellite images were sure the storm was losing intensity. I was sure the storm was getting stronger. I was convinced it was becoming close to a record storm just from the way the eye structure was changing. We could see the structure, but not what the central pressure was, or what the strongest winds were. He issued a hurricane warning for the Florida panhandle around noon on August 16th. Then, from 1 p.m. until 8 p.m., about 380 miles south of Fort Walton, Florida, Camille stopped moving. When a tropical cyclone stalls like this, it means that competing forces are struggling to steer it in different directions. It’s a meteorologist’s nightmare, and there is little one can do but pay close attention until something more happens. 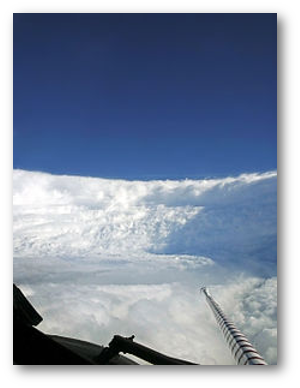 A Hurricane Hunter plane managed to penetrate the storm that evening and found almost record low pressure in Camille’s eye. The hurricane was packing sustained winds of 160 mph, with higher gusts. Camille began drifting north-northwestward. By midday on Sunday the 17th, Simpson had hurricane warnings up for the entire Mississippi coast and as far west as New Orleans and Grand Isle. At 7 p.m. the hurricane was 60 miles east of New Orleans. An offshore oil rig recorded sustained winds of over 170 mph. That was powerful enough to make the Mississippi River run backward from its mouth at the Gulf to Carrollton, 120 river miles upstream. Big freighters, although anchored, were dragged upriver as much as a mile. It has been estimated that gusts of at least 190 miles an hour hit the Bay St. Louis area while gusts of 150 miles an hour or more raked an area of Ansley to Biloxi, Mississippi, along the coast and north to near Standard. At a NASA site near Picayune a 950-mbs pressure (28.06 inches) was recorded with estimated gusts up to 160 miles an hour. Tides ran 15 to 32 feet above normal just east of the storm’s center…. Camille’s official highest wind was 175 mph, the last speed recorded before the anemometer broke. The official lowest pressure was 26.58 inches (900 mb). What damage can winds and seas like that cause? About 150 people died along the Gulf Coast in Hurricane Camille. The toll would have been much higher if not for the evacuations undertaken before the storm hit, as described by Zebrowski and Howard. When the later flooding of Nelson County, Virginia, from Camille’s remnants is also taken into consideration, this single tropical cyclone caused an estimated $1.122 billion – in 1969 dollars. Robert Simpson was the first NHC director to visit the aftermath of a hurricane. He toured devastated areas of Pass Christian, Long Beach and Bay St. Louis, taking notes. At the time, there was no way to gauge the intensity of hurricanes. Simpson was asked repeatedly how people could be warned ahead of time when a particularly dangerous hurricane like Camille was on the way. He could provide numerical data on any given hurricane, but to answer that question he also needed to take things like building codes and structure analysis into account. Upon his return to Washington, Simpson found a letter waiting from civil engineer Dr. Herbert Saffir. Since 1947, Saffir had been working in Florida, doing exactly the sort of post-hurricane structural analysis that Simpson now needed. Saffir’s letter described a five-point scale of potential damage that correlated wind speeds with easily observed damage. While he focused on building codes and survival, Simpson saw the scale in terms of evacuation. Simpson added meteorological data to Saffir’s scale and turned it into the five categories everybody is familiar with today. We’ll take a closer look at it later this week. 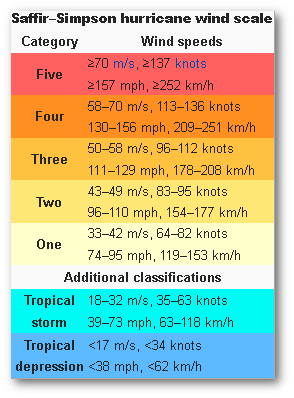 Meteorologists began to use the Saffir-Simpson Scale to describe Atlantic Basin and some North Pacific tropical cyclones during the 1971 hurricane season. Robert Simpson retired from government work in 1974 to establish a consulting firm. Both he and his wife also joined the faculty of the University of Virginia. He has participated in several international weather experiments and contributed to scientific literature, but Robert Simpson will always be best known for the Saffir-Simpson Hurricane Potential Damage Scale, one of the few positive things to come out of 1969’s Hurricane Camille. Ernest Zebrowski and Judith Howard. Category 5: The Story of Camille. University of Michigan. Ann Arbor. 2005. 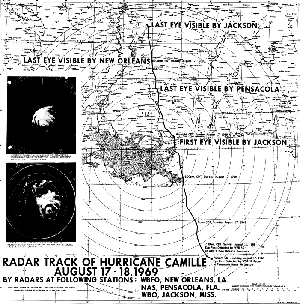 Hurricane Camille (PDF). Environmental Science Services Administration. Camille of 1969 Downgraded to Second Strongest Landfalling U.S. Hurricane. Jeff Masters.